At the podium before the council, the Memorial “Green Team” looks at points it was making on an overhead screen. Albany has so far avoided this particular government intrusion on what people can and cannot do. 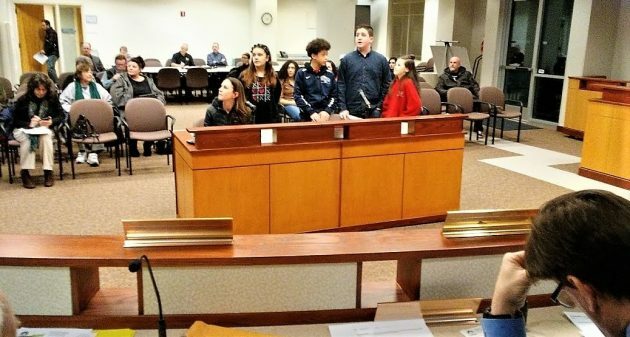 On Wednesday the city council heard a pitch from four earnest middle schoolers. They want the council to consider banning the use of single-use plastic bags for environmental reasons. Among their points: They worry that the bags, being light, are blown into rivers and end up in the ocean, where they could end up being ingested by wildlife, which wouldn’t do the wildlife any good. The council listened with the usual respect it shows school children who show enough gumption to stand up at a public meeting before a government body to make a point. Their presentation displayed on overhead screens listed the authors as Danielle Hernandez, William Summit, Laik Gregory, and Joshua LaBelle. Councilors asked a couple of questions. Mayor Sharon Konopa suggested to the group that they make their proposal to the legislature too. Oregon lawmakers have shown no interest in a statewide plastic bag ban after the idea got nowhere two or three sessions ago. Totally agree! I will support those kids any way I can. Who is behind prodding these kids to complain??!! Why do we assume they are manipulated? We should raise our children to think for themselves regardless of whether we agree with them or not. Do we not trust our educators? Each city has its own culture. I don’t compare our city to any other. Albany is a wonderful place to raise children. My kids loved growing up here and still have ties. I intend to visit their school, Memorial, to find out about their “Green Team.” It may be something they feel strongly about just as you do in opposing it. It’s good to hear ALL our voices. Kids have a mind of their own and good ideas of their own. They are learning about pollution and how plastics are bad for the earth. Good for the students. Regardless of how you feel about city ordinances banning plastic bags, there are a few things to appreciate about this. Young people are being exposed to city government workings and public speaking. They’re learning how to make an articulate, persuasive request. And they are presenting information that is fact-based; plastic bags (while useful to some) are a large pollution source. I applaud these students for being involved in local government. I have always thought that civics classes should be a mainstay in school curriculum. Since our children are the future knowing how government works on all levels will make them better and more involved citizens. Their cause is a noble one. Plastic bags create tons of waste, most often have only one use and indeed end up an environmental hazard. As one who has gone tnrough the Master Recycling course at OSU and visited the recycling center in Portland where all our curbside recycling ends up I know first hand the problem they created. DON’T put them in your curbside bid. Bring them to your local grocery store to recycle. They jam the sorting machines , which shuts down the entire line operation .This creates a hazard for the workers who have to get down into the machinery to cut away tightly wound up plastic bags in the big augers that move and sort, wiith box cutters. These children support a worthy cause. A small change to a reusable bag is a simple habit we should all voluntarily adopt. I hope these children continue to educate us. My husband has worked in garbage truck sales for many years. THERE IS NO WAY A PLASTIC BAG FROM A VALLEY LANDFILL, CAN MAKE IT INTO A TURTLE AT THE COAST. Try working on a solution to the Great Pacific Garbage Heap, as large as the state of Texas or something. Maybe make plastic bags out of a easier degradable material, but please don’t take bags away. Everyone in Corvallis hates it and so do I. Everyone hates to be told what to do. I totally agree. For the most part most Corvallis residence use recyclable bags. The ones I know don’t hate it. Some stores even give you a credit on your bill for using them. I think the animal issue was just one of their points. We all know children love animals. When I walk on the beach and see a dead sea bird with a plastic ring around its neck it is sad. Kids see these things with modern media. We shouldn’t minimize their concern. Maybe you and I can help them understand the more local impact. That is much easier to solve than a global one for sure. It’s sometimes hard to replace old habits, but don’t discredit yourself, you can do it for the greater good. Think about the little things that can make a difference now. FYI: Where do you think our water flows? Look into the Willamette Valley River and it’s connection to the Columbia (you might be surprised to see it empties into the Pacific Ocean!!). Now try looking up the break down of plastic into micro plastics and how they pollute our grounds, water ways, and fish/wildlife. Then educate yourself on the Great Pacific Garbage Patch and the cause (once again, you might just learn something about how debris is carried through ocean currents! ), And, finally, think about what you’re saying before you speak for EVERYONE in Corvallis. How can they all hate the single-use plastic bag ban when they voted for it and IT PASSED! The tone of this article is predictably unproductive, and mournful of decent human progress. I’m glad to see kids stepping up where today’s generation of adults has failed miserably. I agree we should never discourage children from asking questions, finding solutions and getting involved. It’s heartwarming to see. We don’t need a law if everyone just kept reusable bags when shopping. Without knowing their program we should not assume they are being manipulated. That minimizes what might be genuine concern. I for one am going to visit their school to find out more about their program and them if their principal and parents will allow. I find their community involvement refreshing. I would be glad to share this information. Seems like we’re allowing children to dictate other legislation in our country. Guess this is fair game too. I think our children should have a say. They are the future . The younger they get involved in their city the better for all of us even if we don’t agree with their issue. Im just blown away! A comment like “who cares what a bunch of easily manipulated emerging teenagers want?” is how we got here in the first place. They’re inheriting the irresponsibility of current and past generations. Granted past generations may have been unaware of their negative impact on the environment, but today there’s no excuse. We know better. These kids will be the dwellers of this planet as their home. They have every right to care, every right to have an opinion & every right to take action to protect their home. Most of us would agree that we like to see youngsters learning about civics and to participate in the political process. However, we need to remember (and also remind them) that they are young and have a lot to learn about life (including the governmental process). There’s a reason these children are not eligible to vote. They are still young, impulsive, easily swayed, and largely ignorant (but not stupid). Most grow and mature and develop healthy attitudes and lifestyles. So, teach them how our government works – yes, absolutely. But also teach them tolerance, good values, and responsibility so when they are old enough to vote, they do so with a regard for their fellow citizens who may not agree with them (and may even be right). I wonder what you think is impulsive or ignorant in this case? Have you read their findings? And Is bringing a reusable bag so difficult? You know what kills me? The older generation likes to call millennials & younger generations “Snowflakes” implying they are so fragil, lazy & unwilling to work hard. But when it comes to the environment, many in the older generation refuse to even be “inconvenienced” by bringing in a reusable grocery bag. Who’s the snowflakes? “Earth Muffin” is the term I use. People complain about kids these days but I take more issue with what the supposed adults are saying. Denigrating kids for caring about out future (no matter if you think they are misguided or not) is beyond pathetic. Katherine asks the question “do we not respect our teachers” giving good guidance??? Public school teachers openly wept and voiced their disgust in front of students when Hillary was defeated by Mr. Trump—evidence that persuasion on political issues is real. Guidance oftentimes is biased by telling only one side of an issue. Kudos to the kids for joining the democratic process; that’s definitely something worth encouraging. Myself, I like plastic bags and use and reuse them until they’re truly garbage, then I toss them into the trash. I won’t believe Corvallis’ ban has done anything other than irritate and inconvenience until I see some data that show otherwise. Thank you for saying exactly what I wanted to. I’m all for kids getting involved. I live in Corvallis; it’s a huge irritation and inconvenience. I currently use ratty, dirty, multi-year-old plastic bags to do exactly what environmentalists should approve of – transport groceries with my bike. Those bags are much better suited to this purpose than the usual “reusable” bags which all have far-too-long handles. For a while I was stuck using the bus instead of my bike, sometimes with a “trolley” cart, sometimes without. Either way, the evil plastic bags were easier to deal with than “reusable” bags or paper bags. Expertly packed paper bags are great for loading into car trunks, if you have just the right number of bags. I think the bans are mostly greenwashing and of little consequence compared with everything else we do wrong environmentally. People seem to have a need to feel good about some little things they do (or make others do). Maybe I’ll change my mind if someone can point to convincing evidence that I’m wrong. I recently ran across an old copy of THE WHIRLWIND in a box of old stuff my parents had held onto. It’s from Sept. 24, 1971. Back on page 8 is an article titled, Glass recycling center does ‘surprising’ business. The bottom of the article is a picture of myself, Larry Sutton and Bob Ivers bringing class to the SEA recycling center. It is clear that students sometimes get behind concepts that make no sense, have no chance of success and are just a big waste of time. When our family moved to Albany over 15 years ago we used to see multiple plastic bags from the Heritage Mall area blow down the street past our house on a windy day on a regular basis. It’s rare that we see a bag blow down the street now. One can hope that people are being more careful how they handle plastic bags now that we are aware of the problem they can cause. Biodegradable “plastic” bags is the way to go IMO. Danielle is my younger sister. She is the one who made this slide show for this meeting and did her research. My sister very much cares for the environment and worked very hard on this project. Not because she was manipulated, but because she truly does care. She and these three other kids deserve your respect for having the courage to stand up in front of grown adults and tell them there NEEDS to be a change. You adults with negative comments should sit back and ask am I attacking these kids because I truly don’t believe what they are working towards, or is it because I don’t want to be inconvenienced with bringing my own bags to go grocery shopping. Costco doesn’t give bags, no one complains there! Sit back and quietly applaud these children for doing something good for our earth instead of bringing nothing but destruction like past generations has brought us. Bravo. Well said. This is the year that a younger generation begins to take their their place as leaders of our country. Having piloted an rv 40000 miles around the US, I csn tell you that the most common litter is a plastic bag tangled in a fence. Yup, they’re convenient. Yup, there are places to return them for recycling. But there’s only one place that actually has a use for them. So we actually trade convenience for landfill space. To the curmudgeons denigrating the students, give ’em a break. They had the gumption to speak publicly on a topic that many ridicule. Judging from some of the reactions here, they were successful in striking a nerve. Counting manufacture, maintenance, fuel and final disposal, how many plastic bags is that worth? I have 2 big dogs and so does my sister. I use 2 plastic bags a week picking up my backyard. I would rather not use over 10 potty bags just to do that task. Then don’t! It’s funny how people think a single-use plastic bag ban will get rid of all “grocery sized” plastic bags! (I wish!) Don’t worry, you’ll still have your precious plastic bags available to buy. However, it may make you cut back on using two bags a week to using one or none. Did you know there are eco friendly bags that do the same job?? If you can afford two “big” dogs I bet you can be more environmentally responsible by buying or finding alternatives for their waste. After all, we didn’t always have plastic bags at our disposal. what are the kids willing to give up? Kids today always want to take away but never hear of them giving up something. How about no cell phones until 21. No M rated video games until 21. Let’s ban cell phones from.schools entirely. Get caught it gets smashed. Why do we need to ban them? Let’s let the stores choose and people choose if they want paper or plastic. All you have to do is ask for paper when you shop. We don’t always need need laws. I want to ban school buses. Kids can walk. Cuts down on pollution. Let’s see these environmental kids show us the way. Way to go kids! I’m proud of your cited research and respectful approach in asking the council to consider a plastic-bag ban (You’ve surpassed many adults this day & age.) I’m sure this is only the beginning to try and catch Albany up to the rest of its surrounding communities. Awareness counts, even if it doesn’t go through, you’ve shown you care for the environment and your future. Bravo for thinking beyond yourselves. To set the record straight, the voters of Corvallis did not vote to ban plastic bags the City Council did. I work part time at a store in Corvallis and have heard from some of the checkers how dirty the bags are that some people bring in for their clean groceries. Some have said they have seen mouse and rat dropping in the bags. Banning plastic grocery bags isn’t the answer. Take a look down the freezer, bread, pet food and lunch meat aisle and see all the plastic, plus more. Give me a sanitary clean bag anytime. If you want a bag in Corvallis you have to pay a nickel and get a paper bag. Wonder how many trees are cut to make paper bags. They do recycle but so do plastic bags. There may be ways to recycle plastic bags, but Republic Services specifically does NOT want plastic bags in the commingled recycling because it gums-up the equipment and forces a lot of manual intervention. There are collection bins for plastic bags in (some? most?) grocery stores. I don’t know if the bags are actually recycled or if it’s just greenwashing. With the new Chinese regulations against importing excessively contaminated recycled materials, almost all “recycling” could now be just greenwashing. And who do you think influenced the Corvallis City Council?